Walking is a solid and accessible form of exercise that can help you lose weight when combined with calorie control. You'll lose weight when you burn more calories than you take in, which helps your body use fat stores as an energy source. Before starting any new exercise regimen or eating plan, consult your doctor for medical advice. A pound of body fat contains 3,500 calories. Therefore, you need to burn 3,500 calories more than you consume -- over a period of time -- in order to lose a pound of weight. If you consistently consume more calories than your body requires to maintain a steady weight, you may either fail to lose weight or gain weight, despite daily walking. According to the CSG Network's calorie burn calculator, a 160-lb. 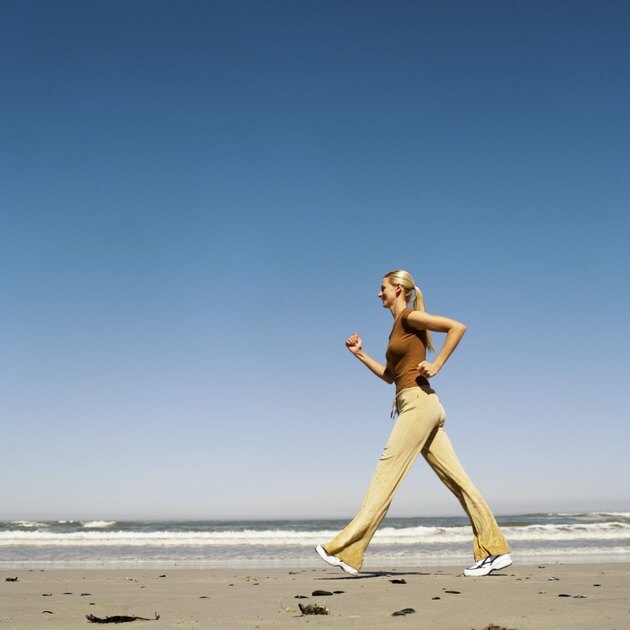 person walking for 20 minutes at a brisk pace of 3.5 mph will burn 97 calories. Therefore, if this person walked 20 minutes daily every day of the week, he would burn a total of almost 700 calories. If the daily calorie intake was exactly the amount required to maintain a steady weight without exercise, the calories burned through walking would create a sufficient deficit for a pound of body fat to be lost every five weeks. The number of calories burned when walking depends on a number of variables. The heavier you are, the more calories you will burn when walking the same time, distance and speed as a lighter person. Therefore, you may find it easier to lose weight at the start of your diet and exercise plan. Walking faster also burns more calories -- a 160-lb. person will burn 109 calories walking 20 minutes at 4.5 mph as opposed to 97 calories at 3.5 mph. Walking is a low-impact form of exercise which places much less stress and strain on your body and joints than running, jogging or other high-impact sports. Additionally, it doesn't cost anything to go for an outdoor walk, apart from buying a supportive pair of walking shoes. If you have a lot of weight to lose or have joint problems such as arthritis, you may find that walking on softer surfaces -- grass or sand, for example -- is lower-impact than walking on hard sidewalks. How Many Calories Are Burned During a 40 Min. Brisk Walk?